After Amy had her amazing experience written down in her Ghana Files over the last two years, I realized I haven’t blogged in ages. I didn’t even write a single blog post when I spend all of last December in China. So it’s about time. 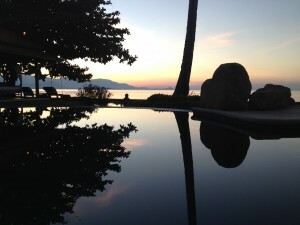 I should say that we spend most of the time on Ko Samui, a Thai island, in a private villa for Nomadic Pairs wedding (finally)! The villa definitely gets a thumps up, it’s called Ang Thong Villa. What we did see of the island reminded me a lot of the Caribbean: nice sand beaches going directly into the jungle or a restaurant and a general relaxed attitude. I heard Chaweng beach was crowded and busy, but didn’t feel like it when we were there. Bo Phut beach was cool and nicer looking from the bars/restaurants point of view. Otherwise? Temples and elephants. Not sure if there is some of the old Hippie trail left that made the island famous in the 60s, mostly it is rather close to the tourist trail nowadays.